When trying to match lost and found pets, be aware of potential problems when comparing photos. Lighting conditions, exposure, subject position, camera angles, the age of photos (of lost pets), the pet’s condition, the position of eyes or ears, etc. All can affect our perception and cause us to miss a match. An obvious difference in these two photos is the location of the eye patch. Why the difference? When you snap a photo with the front-facing (selfie) camera on a cell phone and send it with Facebook Messenger using the camera icon on the command menu, Messenger sends the image as it appears in the preview on your phone – as a mirror image. Photos taken with the selfie camera are flipped when they are stored as files (on both Android phones and iPhones), so there is no problem with sharing images previously saved as files (left is left in the photo image). When viewing photos, look for clues that suggest the photo was taken with a selfie camera and sent with Messenger (or perhaps some other app) as a mirror image – text that is reversed, objects that are reversed (e.g. a steering wheel on the right side of a car), or a rearview mirror angled toward the passenger side of a car. Also look for other telling features (though this can be tricky). In these two photos, notice the tiny dark spot beneath the eye surrounded by white. 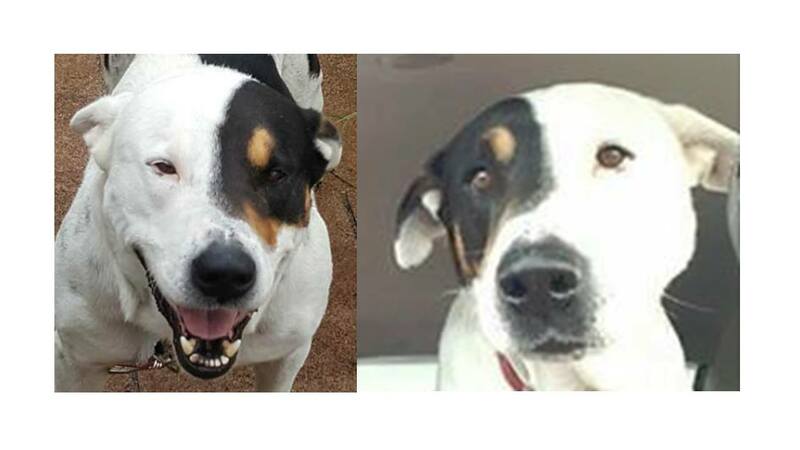 It appears in both photos – an indication that this is the same dog. But notice the splotch of brown at the base of the eye patch in the photo on the left. It is barely visible in the photo on the right, obscured by the upward tilt of the dog’s head. Of course it always helps to have more photos that can reveal additional markings and features of the pet. Note that when filing a lost or found report with www.HelpingLostPets.com (HeLP) you can upload as many as five photos. And if you are a pet owner, keep plenty of photos of your pets – easy to do in this age of digital photography and cell phone cameras. If your pet ever goes missing, those photos may help to get him or her back home! Useful Tools Lost Dogs of America, matching tips, photos. permalink. ← Lost or Found a Pet? Helping Lost Pets Now Offers Free Multi-Language Flyers!